Over the next three articles, we will discuss the tools needed to strengthen joint use partnerships. We will focus on the ways that inspections and inventories, paired with a centralized asset management system, are critical to managing an organization’s assets and keeping partnerships with stakeholders operating smoothly. America’s favorite New Year’s resolutions include: be healthier, learn something new, get organized, and keep the weight off. Just for fun, let’s look at how these popular resolutions could apply to utility pole maintenance. The number one resolution in America in 2015 was to be fit and healthy. In the utility and communications industries, healthy means safety—to the public and to workers. Safety is the number one reason to conduct pole inspections on a regular basis. The public’s and utility workers’ safety is a priority for owners and attachers. Utility pole inspections are crucial to protect the public from the consequences of pole damage, decay, and unsafe conditions. Information gained from inspections helps pole owners determine if utility poles are in danger of falling, and drastically reduces liability to the owner for resident’s home or property damage. Further, weak or damaged poles, climbing obstructions, excessively tight lines, and cracks present serious dangers to utility line workers. Utility line workers have one of the most dangerous jobs in the country. Proper inspections ensure poles are reinforced or replaced before any negative consequences occur. One common resolution is to learn a new hobby. In the joint use industry, learning new information about your joint use assets may not be quite as enjoyable as a new hobby – but the results can have a significantly greater impact. Often, minor violations may be known to owners, like damaged hardware or insect infestations, but may seem trivial and appear to lack urgency in correction. However, minor violations and environmental hazards can take a quick turn for the worse. For example, small splits in a wood pole from woodpecker hollows may look insignificant for amendment on the outside. The pole does not seem to be in danger of failing, it still strongly holds its attachments, and the pole hardware is in good condition. Three months later, a damaging storm comes through the area and the once-small splits turn to wide splits and cracks. The wires and attachments are now dangerous and a pole transfer is of immediate necessity. Sometimes minor violations are unknown to asset owners because of a lack of routine inspections. The owner does not know about minor violations until they turn into major violations and harmful conditions, leading to costly problems. Look at the same situation as above— a pole with small splits in a wood pole from woodpecker hollows—but in this scenario the owner does not know about the minor violations. An attacher from another provider notices these small splits when deploying services, but does not relay them to the owner because they seem inconsequential. Had the attacher been empowered to easily relay the information to the owner, the owner may have taken action. Further, if the owner had routine pole inspections in place, they would have the knowledge from the most recent inspection report. In this case, we’re not talking about your closet or those piles of craft supplies in the spare room. We’re talking about knowing what joint use assets you have, and where they are located. Natural disasters, including heavy storms or tornadoes, are inevitable. Owners and attachers know there is always a chance of weather degradation and hazard. The key to keeping assets in line for storms is organization and preparedness. Falling trees and limbs are one of the primary causes of utility line and pole damage during storms. 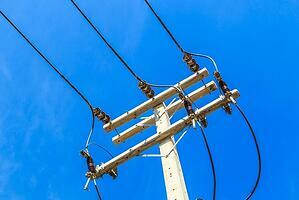 Inspections help identify trees near power lines that need to be trimmed. Up-to-date information gained from inspections improves response times when accidents happen, as technicians can use stored data to check for known structural issues, as well as attachments that are effected on any individual pole. Utility pole and conduit vault violations and damage, trespass, and the effects of negative environmental conditions are costly. Many of these costs can be mitigated with accurate field records, shared across multiple departments to improve business efficiencies and enable more strategic joint use activity in the field. No need to commit to an expensive gym membership (that you’ll probably only use for a few weeks, and then wonder why you’re still paying for it in July). In our industry, we know that overloaded poles can break or fall more easily due to excess weight, causing possible damage and injury. Utility pole inspections are used to verify pole heights and enable the pole owner with an accurate record of how much space is available for attachment requests. Real change occurs through consistency and creating new routines. The same goes for keeping asset management resolutions: a routine and thorough asset inventories are the keys to streamlining business efficiencies and strategizing joint use field activities. Companies that contract out an asset inspection should be able to see an overview of in-progress asset inspections. Ideally, service providers use dashboards and software to keep visibility and lines of communication open between owners and inspectors. Owners should always know how many poles have been audited to date; how many are left to be audited; the percentage of project completion; and changes to the project schedule. Owners should also be able to view the cost of the audit to date, allowing for proper budgeting and forecasting. Accurate inventory records enable companies to determine the precise location of their network assets. This allows quicker determination of serviceability, streamlined deployment, and more efficient responses to existing customer requests. Field inspections keep deployment and service management teams operating faster and smoother. They help owners and attachers communicate and work better together, setting up our communities and companies up for a happy and successful 2018. What are some of your business resolutions for 2018? Share with us in the comments below.